Lightwaves 2018: Free festival of light at Salford Quays. Brightening up the gloomy Salford evenings this December is the Lightwaves Festival. This 10-day-long programme of digital light art takes over the public spaces around The Quays and MediaCity. It features 16 artworks, including two major commissions – both of which are interactive. 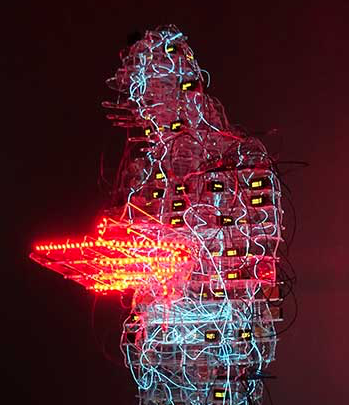 ‘Youth Culture’ takes the form of a towering hooded figure with LEDs that change behaviour when approached. Audiences can send messages to the sculpture which will be portrayed as news streams on its surface. ‘Spectrum’ invites audiences to talk to it, and they will be able to see and hear their words as moving lights and soundscape. The festival also has some returning favourites from previous years, including a giant red squirrel which will be illuminated by visual projections. There’s also four new commissions from up-and-coming artists. The launch weekend will feature special additions to the programme, including a public performance by the Manchester Survivors Choir, interactive workshops, talks, and tours.